I am a California native, born and raised here in San Luis Obispo. How did you end up in the wine industry? Growing up working in my family garden I realized my love for agriculture, and after extensive travel to Europe and South America I knew the wine industry was my true calling. When it came time for college I decided to study Agribusiness Marketing with a minor in Wine and Viticulture at Cal Poly State University, San Luis Obispo. I worked on the campus vineyard, learning the ins and outs of growing grapes and also took an internship at Claiborne & Churchill Winery in 2002. I would say this is where my love for winemaking grew and pushed my passion for wine even further. At what point did you become winemaker at Claiborne & Churchill? 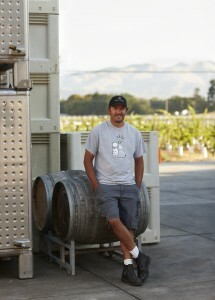 Under the guidance of our owner and founding winemaker Clay Thompson, I learned traditional European winemaking techniques and was quickly promoted to the role of assistant winemaker in 2004. I supplemented this education with additional enology classes at the University of California Davis. And in 2007, I was officially promoted to head winemaker. Can you describe your winemaking style? I like to say I take a hands-on approach to winemaking. Get in and get dirty. As a winemaker, my job is to highlight the best qualities of each vintage. Each vintage is different and brings something positive or unique to the table. My job is to showcase the vineyard and vintage in each glass of wine. My wines are not the biggest, boldest, or most tannic. They show extreme finesse. My style is to make balanced wine that accompanies food that show solid structure, elegance, and age ability”. When you’re not making wine, how do you spend your time? When I’m not knee deep in winemaking, I enjoy the outdoor lifestyle here on the Central Coast with my wife Katie and daughter Callie. I like to surf, snowboard, mountain bike and grill on my downtime.